All the harvests in today’s post are from window boxes. 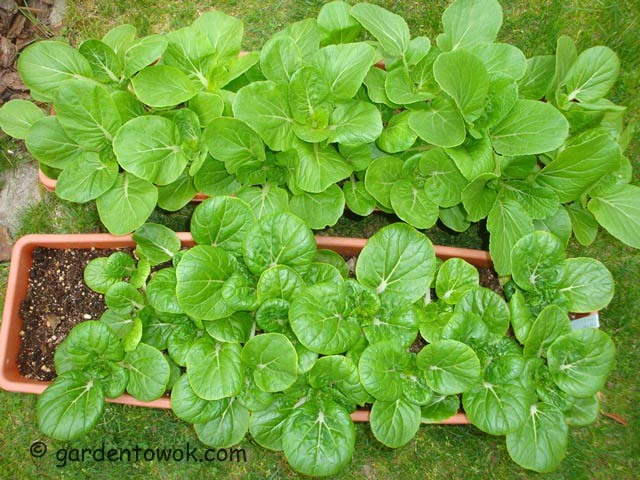 As you can see from the photo below, both the Shanghai Bok Choy and Baby Bok Choy in the window boxes are overcrowded. Thinned out both the Shanghai bok choy and the baby bok choy, the remaining plants now has room to grow and mature. Harvested 8+ ounces of Shanghai Bok Choy and 5+ ounces of Baby Bok Choy. The Shanghai Bok choy were grown from seeds I saved. Because the original was a hybrid these look quite different from the original and not as tender. Need to get fresh seeds. The baby bok choy were also from seeds I saved but because the original was not a hybrid they are just like the original. Tender with a hint of sweetness. Only 3 of the Lolla Rosa lettuce seeds germinated 2 did not make it. 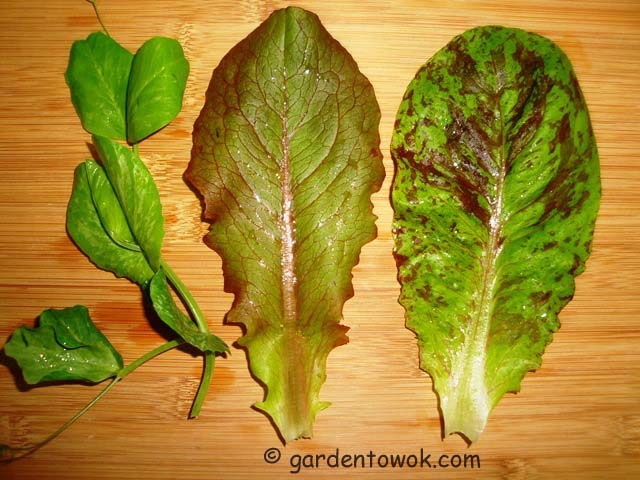 Decided to harvest just the outer leaves of both the Cimmaron and Forellenschluss lettuces. The plants will keep growing and I will continue to just harvest the outer leaves thus extending the harvest. The germination rate for the sugar snap peas was poor reason for all those empty spots. I cut the tender tips of each plant hoping the plants will send out many side shoots. Harvested 3+ ounces of Pea shoots and 6+ ounces of lettuce. The entire pea shoot, including the tendrils, is edible. Made a simple but delicious salad with lettuces, pea shoots and chickpeas sprouts. The lettuces were crunchy and the pea shoots were tender with a hint of peas. Click here for step-by-step tutorial on growing chickpeas sprouts. 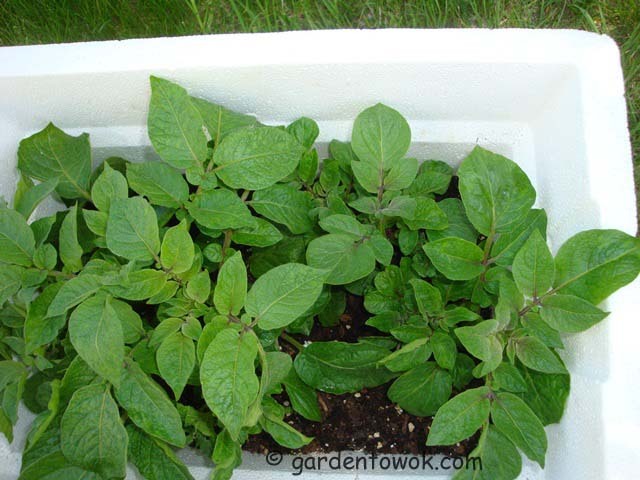 The spinach in the window box were thinned on 5/3/15 (click here for photos) it is overcrowded again in just 6 days. Harvested 8+ ounces of Spinach. Should get another harvest in a few days. Some of you may recall my post of 4/27/15 (click on link and scroll down) where I showed a photo of my frost damaged blue potatoes. The frost damaged plants not only bounced back but are doing well. They are almost caught up to the undamaged plant on the left. This entry was posted in Container gardening, Gardening, Harvest Monday, windo box gardening and tagged baby bok choy, baby spinach, cimmaron lettuce, forellenschluss lettuce, growing chickpeas sprouts, lolla rosa lettuce, pea shoots, Shanghai bok choy, spinach, sugar snap peas. Bookmark the permalink. wow those bok choy are looking really GREAT! Are those potato leaves ediblelike sweet potato leaves? Those are blue potatoes NOT blue SWEET potatoes. Sweet potato leaves are edible, potato leaves are NOT edible. Everything you grow is always so incredibly healthy Norma. Wonderful! All I have planted lately has been winter flowering plants. Thanks. Would you do a post on your winter flowering plants? Lovely greens. 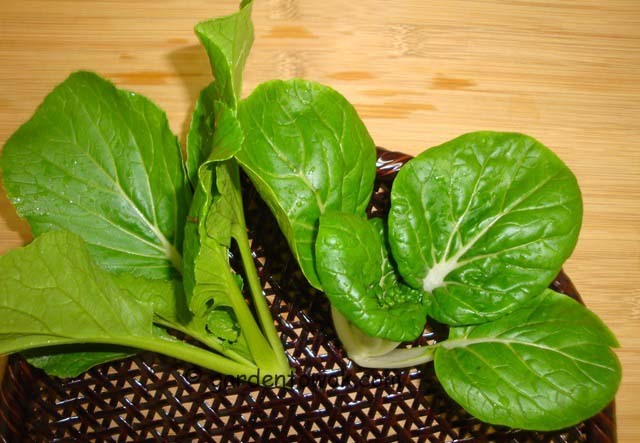 I used to grow and love those white stemmed baby bok choy. I haven’t grown them in a few years though. I am disappointed with my Shanghai bok choy but I least I know not to try saving seeds from hybrid. Looking forward to seeing posts of your planting. Your leafy greens are lovely. I am still in the process of digging the garden 😦 and weeding.I haven’t planted anything new. Thanks. I still have part of my garden to dig, way behind, hoping to catch up soon. You always grow the most amazing vegetables in your window boxes. I don’t know how you do it, my container veggies always seem so pathetic. Because of the limited nutrients in a container, container grown plants require more frequent fertilizing, I fertilize with 1/2 strength fish emulsion fertilizer every week. All of your greens look amazing! For some reason, mine don’t seem to be doing that well this year. I started most of them quite late so I’m hoping that they will pick up the pace, especially now as it’s been so much warmer. Thanks, I am sure they will pick up pace with the warmer weather, been a long, long winter for sure, I am quite behind with outdoor chores. 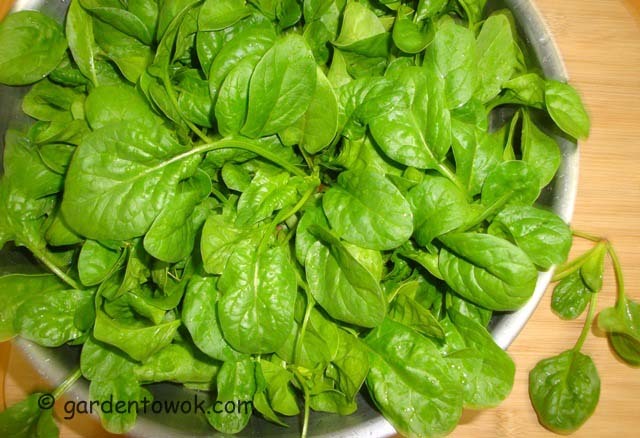 Your baby spinach looks great! I would be adding that to all my dishes! I have been adding the baby spinach to different dishes. You really do get a lot from your container plantings. All those greens look amazing! Thanks. Sure glad my window boxes are producing, no greens from my garden yet. What a great container harvest, I bet you had some very delicious meals out of it all. As I mentioned in my email, my garlic did not make the winter and I have decided not to try again (famous last words). But my herbs were planted last week and are doing excellent. I love not having to buy herbs in the summer (my winter garden didn’t work out). I’ll just have to admit that gardening is not something I am good at so I’ll leave it to the experts, like you! Thanks. Sorry about your garlic, I’ll give it some thoughts and see I can come up with a solution. Glad your herbs are doing well what are you growing? Hi Norma, I’m a basil fanatic so I have a pot filled with four types: columnar, Thai, purple and traditional. I also planted mint (mainly for mojitos and to keep the squirrels out), sage, oregano, cilantro and flat leaf parsley. You have quite a herb garden going there. Didn’t know mint will keep squirrels out, learned something new, thanks. I agree with Mandy, everything you grow always looks amazing. You just inspire me. And I absolutely love that spinach. Oh I can eat that all day long. Love this post Ms. Norma. I have my failures. Glad you enjoy my post. My window boxes are doing well this year and the critters decided to leave them alone making me very happy.. A great week to you too. The sugar snap peas seeds were old, should have sown thickly or purchased new seeds, next year. If you lived next to me I would be the lucky one for sure, you will be welcomed anytime to harvest from my garden whatever you need for your food plating presentation and cooking I will be in your kitchen feasting and enjoying your creations. 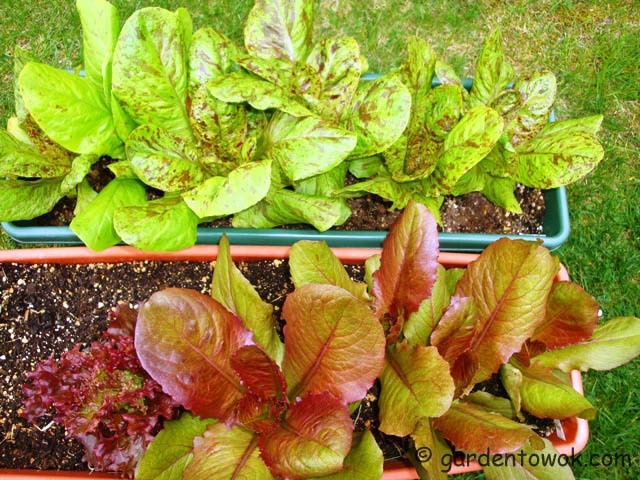 Your window box greens look so good, I’m holding off on seed starting due to upcoming trip, my summer crops will be late starting again! Thanks. How are you Okinawan and Purple Sweet Potatoes doing?